Looking for a comforting meal? 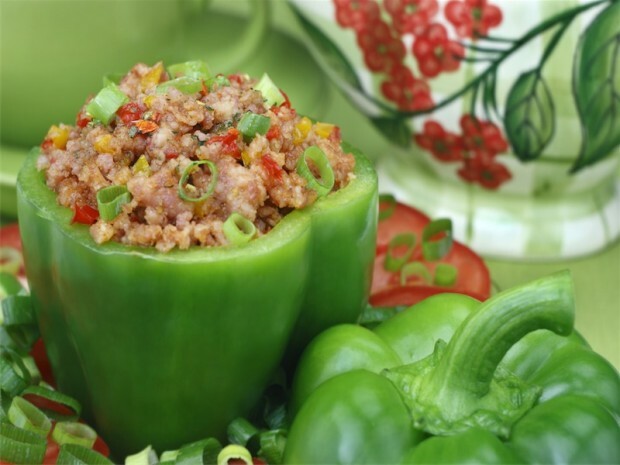 These delicious stuffed peppers are a great and hearty meal for any phase after the Attack phase. They are filled with flavorful ground beef – ground turkey or chicken would also work – and cooked in a warm tomato sauce. They also freeze great after being cooked so make a bunch and freeze the extras for quick lunches or dinners. Missing the rice that’s usually in stuffed peppers? Consider adding a cup of finely chopped cauliflower to the mixture to mimic the texture of rice. You won’t know the difference. 1. To prepare the peppers, cut off the tops and remove all the seeds and membrane. Then chop up the remaining pepper pieces and set aside. 2. Place the peppers in a large pot of salted water, enough to cover them. Bring to a boil and once the water is boiling, cover and reduce the heat to low. Let cook for five minutes to soften up the peppers and remove. 3. In a large skillet sprayed with cooking spray, add the onions and cook over medium heat for about five minutes. Add in the celery and chopped peppers. Then add in the diced tomatoes, tomato sauce, garlic, oregano, basil, 1 tsp salt, and 1/4 tsp pepper. Stir and let simmer for ten minutes to create the tomato sauce. 4. In a large bowl, whisk together the egg, remaining salt and pepper, and the Worcestershire sauce. Then gently add the ground beef and one cup of the tomato sauce. Mix together until just mixed. 5. Stuff each pepper with the ground beef mixture and place in a baking dish. Cover with remaining tomato mixture. Bake for one hour. Is tofu an approved food for the Dukan Diet?